Sophie McAdam, True Activist | All German will offer starting this week, after the region of Lower Saxony changed its policies to fit with the rest of the country. 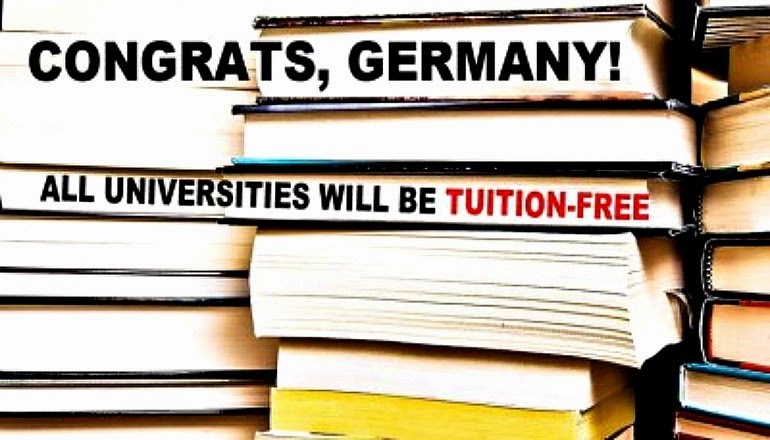 German policy-makers say that free university is a basic right, and that tuition fees are unfair and discourage poorer students from continuing with their education. Dr Holger Fischer, vice-president of Hamburg University, said: “There is a tradition here that education is free from beginning to end, and that is very difficult to change.” This attitude is by students in Germany, who admit to thinking other countries “crazy” for charging people to learn. can also benefit from Germany´s decision to scrap tuition fees, and more information on studying in Germany can be found here. Masters degrees are not included in the plans to scrap tuition fees, although costs are still much cheaper than countries like the U.S for post-grad study. It is important to the university and course provider for specific information as our research shows that prices can differ, but in most cases only a very small administrative fee is charged. Students from outside the E.U might find their biggest obstacle to study in Germany is obtaining a visa, although steps are being taken to remove these blocks (more information here). Germany has followed of leading European countries Denmark, Finland and Sweden, all of which offer state-funded higher education. Should higher education be a basic human right? Have you experienced problems in higher education because your parents couldn’t afford to help you out? Let us know your thoughts in the comments!